A reporter raised a safety concern regarding the cycle spaces allocated on the new Great Western Railway (GWR) electric express trains. On the GWR electric express trains, there are eight cycle spaces in pairs which are accessible via four of the twenty passenger doors. These doors are not labelled, and so it is not possible to see cycle spaces unless boarding. 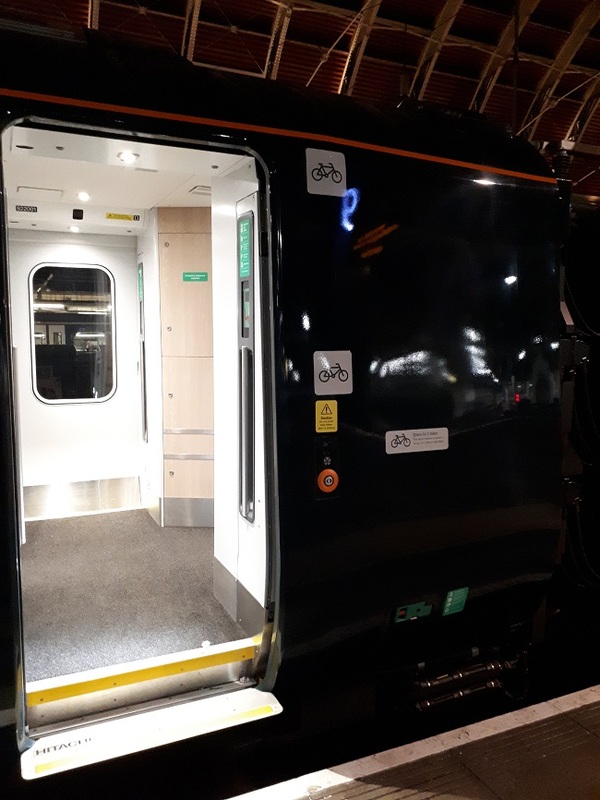 Once aboard, if there is no cycle space, passengers can either leave their bicycle in the door lobby, risking obstruction and a trip hazard for other passengers, or seek a space elsewhere, which entails leaving the train that is about to depart. label the doors with signage outlining carriages with cycle spaces? investigate whether it is reasonably practicable to provide cycle space vacant/occupied indication visible from platform? GWR’s Intercity Express Programme (IEP) Commercial Manager has confirmed that final discussions are taking place with Hitachi Rail Europe (HRE) before cycle signage is applied to the new Intercity Express Trains (IETs). The IEP Commercial Manager visited the North Pole Depot in October 2018 and inspected a train fitted with exterior cycle labels. Fitment across the full IET fleet was delayed because other labels did not meet the specification and requirements of GWR and other stakeholders - the bike labels were part of a wider review of the entire labelling guide. Following the above meeting, all labels have now been agreed and fitting has commenced. The new label guide has been cut into the production line and all those accepted and stored at North Pole depot. Accepted trains from January 2019 have been fitted with the new bike labels and already accepted trains are being progressed through a retrospective fitment programme – you should be seeing them in traffic as we speak.